Happy Christmas everyone! I hope you’ve had a wonderful time. 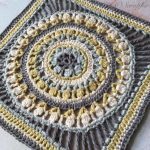 I’ve alternated between being social and semi-hibernation, but also finally found time to finalize the pattern for the next stage of my Flower Wheel Mandala Series – The Large Flower Wheel Coaster Square. 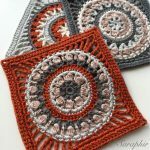 This is the fourth instalment of the series, following on from the Flower Wheel Coaster, the Small Flower Wheel Coaster Square and the Medium Flower Wheel Coaster Square. 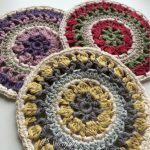 The Large Flower Wheel Coaster Square is noticeably larger than the medium as it allows 2 of the medium and 3 of the small squares along the sides. The plan is to be able to mix and match them all in the end. 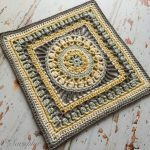 The squares can be made with any yarn – the ones on the photos are made with Scheepjes Catona and a 3 mm hook (4-ply), Drops Belle and a 4 mm hook (DK) and Drops Nepal and a 5 mm hook (Aran), but any yarn and colour scheme would work. 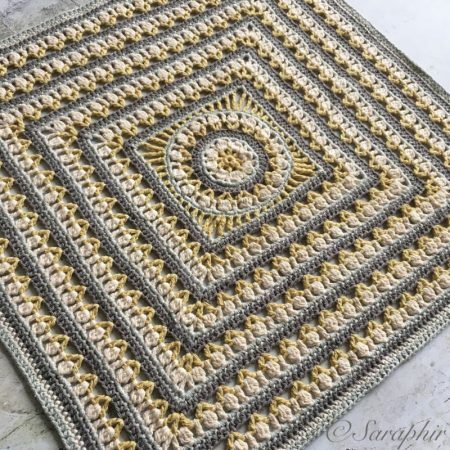 The square with Aran yarn measures 62 cm/24.5 inches across and you need 490 m yarn for it (75 m per 50 g ball). 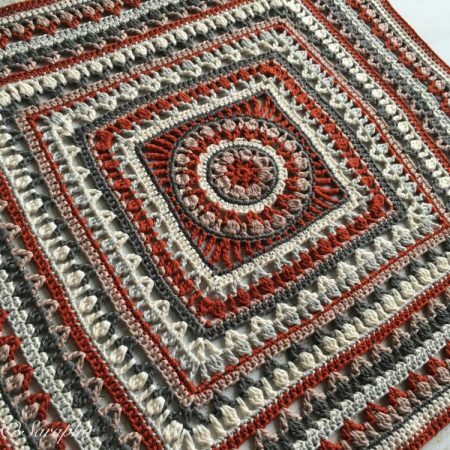 The DK weight yarn measures 49 cm/19 inches across and you need 440 m yarn for it (120 m per 50 g ball). Please remember that this is my design and my copyright. You’re most welcome to use the pattern for yourself, but please do not copy, reproduce, translate or publish it as your own. 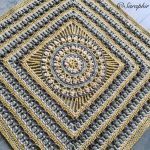 If you sell what you make or post pictures of your makes I would appreciate if you mention where you got the pattern and direct people to my site. Thanks! Beginning treble3together (begtr3tog): attach yarn in any ch sp, ch 2, * yoh, insert through same ch sp, yoh, pull through 2 loops *, repeat from * to * 1 more time, yoh, pull through remaining 3 loops. Treble3together (tr3tog): * yoh, insert through ch sp, yoh, pull through 2 loops *, repeat from * to * 2 more times, yoh, pull through remaining 4 loops. ROUND 1: standing tr in ch2sp, (ch 2, 1 tr, ch 2, 1 tr) in same ch2sp, * (skip next 3 sts, ch 1, (1 tr, ch 1, 1 tr) in next st ), x 7, ch 1, skip next 2 sts, (1 tr, ch 2, 1 tr, ch 2, 1 tr) in ch2sp *, repeat from * to * 3 more times omitting last ch2sp the last time, ss in standing tr. 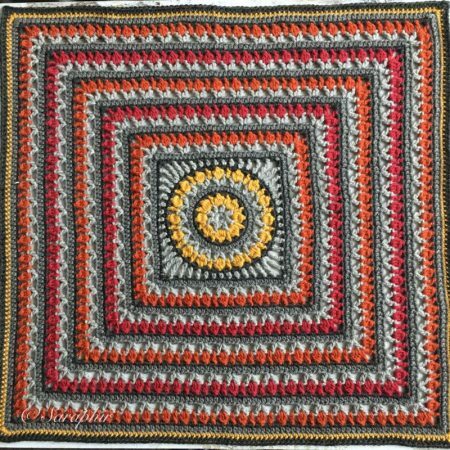 (7 V-stitch along each side, + 4 double V in corners). ROUND 2: (Starting in the first of the double V in any corner): begtr3tog in ch2sp, ch 1 (1 tr, ch 3, 1 tr) in next st, ch 1, tr3tog in next ch2sp, * (ch 1, 1 tr in next ch sp, ch 1, 1 tr3tog in next chsp) x 7, ch 1, 1 tr in next ch sp, ch 1, corner: (tr3tog in next ch2sp, ch 1, (1 tr, ch 3, 1 tr) in next st, ch 1, tr3tog in next ch2sp) *, repeat from * to * 3 more times omitting the last corner, ss in top of begtr3tog. (9 tr3tog + 10 tr along each side incl. corners). ROUND 3: standing dc in any ch3sp, (1 dc, ch 2, 2 dc) in same ch3sp, * 2 dc in next 18 chsp, (2 dc, ch 2, 2 dc) in ch3sp *, repeat from * to * 3 more times, omitting the last ch3sp, join with invisible join to standing dc. (40 dc along each side). ROUND 4: standing htr in any ch2sp, (ch 2, 1 htr) in same ch2sp, * 1 htr in next 40 sts, (1 htr, ch 2, 1 htr) in next ch2sp *, repeat from * to * 3 more times omitting the last ch2sp, join with invisible join to standing htr. (42 htr along each side). ROUND 5: standing tr in ch2sp, (ch 2, 1 tr, ch 2, 1 tr) in same ch2sp, * (skip next 3 sts, ch 1, (1 tr, ch 1, 1 tr) in next st ), x 10, ch 1, skip next 2 sts, (1 tr, ch 2, 1 tr, ch 2, 1 tr) in ch2sp *, repeat from * to * 3 more times omitting last ch2sp the last time, ss in standing tr. (10 V-stitch along each side, + 4 double V in corners). ROUND 6: (Starting in the first of the double V in any corner): begtr3tog in ch2sp, ch 1 (1 tr, ch 3, 1 tr) in next st, ch 1, tr3tog in next ch2sp, * (ch 1, 1 tr in next ch sp, ch 1, 1 tr3tog in next chsp) x 10, ch 1, 1 tr in next ch sp, ch 1, corner: (tr3tog in next ch2sp, ch 1, (1 tr, ch 3, 1 tr) in next st, ch 1, tr3tog in next ch2sp)*, repeat from * to * 3 more times omitting the last corner, ss in top of begtr3tog. (12 tr3tog + 13 tr along each side incl. corners). ROUND 7: standing dc in any ch3sp, (1 dc, ch 2, 2 dc) in same ch3sp, * 2 dc in next 24 chsp, (2 dc, ch 2, 2 dc) in ch3sp *, repeat from * to * 3 more times, omitting the last ch3sp, join with invisible join to standing dc. (52 dc along each side). ROUND 8: standing htr in any ch2sp, (ch 2, 1 htr) in same ch2sp, * 1 htr in next 52 sts, (1 htr, ch 2, 1 htr) in next ch2sp *, repeat from * to * 3 more times omitting the last ch2sp, join with invisible join to standing htr. (54 htr along each side). ROUND 9: standing tr in ch2sp, (ch 2, 1 tr, ch 2, 1 tr) in same ch2sp, * (skip next 3 sts, ch 1, (1 tr, ch 1, 1 tr) in next st ), x 13, ch 1, skip next 2 sts, (1 tr, ch 2, 1 tr, ch 2, 1 tr) in ch2sp *, repeat from * to * 3 more times omitting last ch2sp the last time, ss in standing tr. (13 V-stitch along each side, + 4 double V in corners). ROUND 10: (Starting in the first of the double V in any corner): begtr3tog in ch2sp, ch 1 (1 tr, ch 3, 1 tr) in next st, ch 1, tr3tog in next ch2sp, * (ch 1, 1 tr in next ch sp, ch 1, 1 tr3tog in next chsp) x 13, ch 1, 1 tr in next ch sp, ch 1, corner: (tr3tog in next ch2sp, ch 1, (1 tr, ch 3, 1 tr) in next st, ch 1, tr3tog in next ch2sp) *, repeat from * to * 3 more times omitting the last corner, ss in top of begtr3tog. (15 tr3tog + 16 tr along each side incl. corners). ROUND 11: standing dc in any ch3sp, (1 dc, ch 2, 2 dc) in same ch3sp, * 2 dc in next 30 chsp, (2 dc, ch 2, 2 dc) in ch3sp *, repeat from * to * 3 more times, omitting the last ch3sp, join with invisible join to standing dc. (64 dc along each side). ROUND 12: standing htr in any ch2sp, (ch 2, 1 htr) in same ch2sp, * 1 htr in next 64 sts, (1 htr, ch 2, 1 htr) in next ch2sp *, repeat from * to * 3 more times omitting the last ch2sp, join with invisible join to standing htr. (66 htr along each side). ROUND 13: standing tr in ch2sp, (ch 2, 1 tr, ch 2, 1 tr) in same ch2sp, * (skip next 3 sts, ch 1, (1 tr, ch 1, 1 tr) in next st ), x 16, ch 1, skip next 2 sts, (1 tr, ch 2, 1 tr, ch 2, 1 tr) in ch2sp *, repeat from * to * 3 more times omitting last ch2sp the last time, ss in standing tr. (16 V-stitch along each side, + 4 double V in corners). ROUND 14: (Starting in the first of the double V in any corner) begtr3tog in ch2sp, ch 1 (1 tr, ch 3, 1 tr) in next st, ch 1, tr3tog in next ch2sp, * (ch 1, 1 tr in next ch sp, ch 1, 1 tr3tog in next chsp) x 16, ch 1, 1 tr in next ch sp, ch 1, corner: (tr3tog in next ch2sp, ch 1, (1 tr, ch 3, 1 tr) in next st, ch 1, tr3tog in next ch2sp) *, repeat from * to * 3 more times omitting the last corner, ss in top of begtr3tog. (18 tr3tog + 19 tr along each side incl. corners). ROUND 15: standing dc in any ch3sp, (1 dc, ch 2, 2 dc) in same ch3sp, * 2 dc in next 36 chsp, (2 dc, ch 2, 2 dc) in ch3sp *, repeat from * to * 3 more times, omitting the last ch3sp, join with invisible join to standing dc. (76 dc along each side). ROUND 16: standing htr in any ch2sp, (ch 2, 1 htr) in same ch2sp, * 1 htr in next 76 sts, (1 htr, ch 2, 1 htr) in next ch2sp *, repeat from * to * 3 more times omitting the last ch2sp, join with invisible join to standing htr. (78 htr along each side). ROUND 17: standing tr in ch2sp, (ch 2, 1 tr, ch 2, 1 tr) in same ch2sp, * (skip next 3 sts, ch 1, (1 tr, ch 1, 1 tr) in next st ), x 19, ch 1, skip next 2 sts, (1 tr, ch 2, 1 tr, ch 2, 1 tr) in ch2sp *, repeat from * to * 3 more times omitting last ch2sp the last time, ss in standing tr. (19 V-stitch along each side, + 4 double V in corners). ROUND 18: (Starting in the first of the double V in any corner) begtr3tog in ch2sp, ch 1 (1 tr, ch 3, 1 tr) in next st, ch 1, tr3tog in next ch2sp, * (ch 1, 1 tr in next ch sp, ch 1, 1 tr3tog in next chsp) x 19, ch 1, 1 tr in next ch sp, ch 1, corner: (tr3tog in next ch2sp, ch 1, (1 tr, ch 3, 1 tr) in next st, ch 1, tr3tog in next ch2sp) *, repeat from * to * 3 more times omitting the last corner, ss in top of begtr3tog. (21 tr3tog + 22 tr along each side incl. corners). ROUND 19: standing dc in any ch3sp, (1 dc, ch 2, 2 dc) in same ch3sp, * 2 dc in next 42 chsp, (2 dc, ch 2, 2 dc) in ch3sp *, repeat from * to * 3 more times, omitting the last ch3sp, join with invisible join to standing dc. (88 dc along each side). ROUND 20: standing htr in any ch2sp, (ch 2, 1 htr) in same ch2sp, * 1 htr in next 88 sts, (1 htr, ch 2, 1 htr) in next ch2sp *, repeat from * to * 3 more times omitting the last ch2sp, join with invisible join to standing htr. (90 htr along each side). 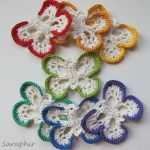 Beginning doublecrochet3together (begdc3tog): attach yarn in any ch sp, ch 2, * yoh, insert through same ch sp, yoh, pull through 2 loops *, repeat from * to * 1 more time, yoh, pull through remaining 3 loops. Doublecrochet3together (dc3tog): * yoh, insert through ch sp, yoh, pull through 2 loops *, repeat from * to * 2 more times, yoh, pull through remaining 4 loops. ROUND 1: standing dc in ch2sp, (ch 2, 1 dc, ch 2, 1 dc) in same ch2sp, * (skip next 3 sts, ch 1, (1 dc, ch 1, 1 dc) in next st ), x 7, ch 1, skip next 2 sts, (1 dc, ch 2, 1 dc, ch 2, 1 dc) in ch2sp *, repeat from * to * 3 more times omitting last ch2sp the last time, ss in standing dc. 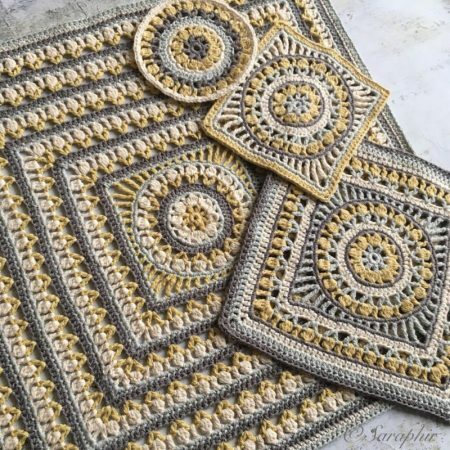 (7 V-stitch along each side, + 4 double V in corners). ROUND 2: (Starting in the first of the double V in any corner): begdc3tog in ch2sp, ch 1 (1 dc, ch 3, 1 dc) in next st, ch 1, dc3tog in next ch2sp, * (ch 1, 1 dc in next ch sp, ch 1, 1 dc3tog in next chsp) x 7, ch 1, 1 dc in next ch sp, ch 1, corner: (dc3tog in next ch2sp, ch 1, (1 dc, ch 3, 1 dc) in next st, ch 1, dc3tog in next ch2sp) *, repeat from * to * 3 more times omitting the last corner, ss in top of begdc3tog. (9 dc3tog + 10 dc along each side incl. corners). ROUND 3: standing sc in any ch3sp, (1 sc, ch 2, 2 sc) in same ch3sp, * 2 sc in next 18 chsp, (2 sc, ch 2, 2 sc) in ch3sp *, repeat from * to * 3 more times, omitting the last ch3sp, join with invisible join to standing sc. (40 sc along each side). ROUND 4: standing hdc in any ch2sp, (ch 2, 1 hdc) in same ch2sp, * 1 hdc in next 40 sts, (1 hdc, ch 2, 1 hdc) in next ch2sp *, repeat from * to * 3 more times omitting the last ch2sp, join with invisible join to standing hdc. (42 hdc along each side). ROUND 5: standing dc in ch2sp, (ch 2, 1 dc, ch 2, 1 dc) in same ch2sp, * (skip next 3 sts, ch 1, (1 dc, ch 1, 1 dc) in next st ), x 10, ch 1, skip next 2 sts, (1 dc, ch 2, 1 dc, ch 2, 1 dc) in ch2sp *, repeat from * to * 3 more times omitting last ch2sp the last time, ss in standing dc. 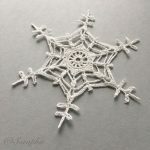 (10 V-stitch along each side, + 4 double V in corners). ROUND 6: (Starting in the first of the double V in any corner): begdc3tog in ch2sp, ch 1 (1 dc, ch 3, 1 dc) in next st, ch 1, dc3tog in next ch2sp, * (ch 1, 1 dc in next ch sp, ch 1, 1 dc3tog in next ch sp) x 10, ch 1, 1 dc in next ch sp, ch 1, corner: (dc3tog in next ch2sp, ch 1, (1 dc, ch 3, 1 dc) in next st, ch 1, dc3tog in next ch2sp) *, repeat from * to * 3 more times omitting the last corner, ss in top of begdc3tog. (12 dc3tog + 13 dc along each side incl. corners). ROUND 7: standing sc in any ch3sp, (1 sc, ch 2, 2 sc) in same ch3sp, * 2 sc in next 24 ch sp, (2 sc, ch 2, 2 sc) in ch3sp *, repeat from * to * 3 more times, omitting the last ch3sp, join with invisible join to standing sc. (52 sc along each side). ROUND 8: standing hdc in any ch2sp, (ch 2, 1 hdc) in same ch2sp, * 1 hdc in next 52 sts, (1 hdc, ch 2, 1 hdc) in next ch2sp *, repeat from * to * 3 more times omitting the last ch2sp, join with invisible join to standing hdc. (54 hdc along each side). ROUND 9: standing dc in ch2sp, (ch 2, 1 dc, ch 2, 1 dc) in same ch2sp, * (skip next 3 sts, ch 1, (1 dc, ch 1, 1 dc) in next st ), x 13, ch 1, skip next 2 sts, (1 dc, ch 2, 1 dc, ch 2, 1 dc) in ch2sp *, repeat from * to * 3 more times omitting last ch2sp the last time, ss in standing dc. (13 V-stitch along each side, + 4 double V in corners). ROUND 10: (Starting in the first of the double V in any corner): begdc3tog in ch2sp, ch 1 (1 dc, ch 3, 1 dc) in next st, ch 1, dc3tog in next ch2sp, * (ch 1, 1 dc in next ch sp, ch 1, 1 dc3tog in next ch sp) x 13, ch 1, 1 dc in next ch sp, ch 1, corner: (dc3tog in next ch2sp, ch 1, (1 dc, ch 3, 1 dc) in next st, ch 1, dc3tog in next ch2sp) *, repeat from * to * 3 more times omitting the last corner, ss in top of begdc3tog. (15 dc3tog + 16 dc along each side incl. corners). ROUND 11: standing sc in any ch3sp, (1 sc, ch 2, 2 sc) in same ch3sp, * 2 sc in next 30 chsp, (2 sc, ch 2, 2 sc) in ch3sp *, repeat from * to * 3 more times, omitting the last ch3sp, join with invisible join to standing sc. (64 sc along each side). ROUND 12: standing hdc in any ch2sp, (ch 2, 1 hdc) in same ch2sp, * 1 hdc in next 64 sts, (1 hdc, ch 2, 1 hdc) in next ch2sp *, repeat from * to * 3 more times omitting the last ch2sp, join with invisible join to standing hdc. (66 hdc along each side). ROUND 13: standing dc in ch2sp, (ch 2, 1 dc, ch 2, 1 dc) in same ch2sp, * (skip next 3 sts, ch 1, (1 dc, ch 1, 1 dc) in next st ), x 16, ch 1, skip next 2 sts, (1 dc, ch 2, 1 dc, ch 2, 1 dc) in ch2sp *, repeat from * to * 3 more times omitting last ch2sp the last time, ss in standing dc. (16 V-stitch along each side, + 4 double V in corners). ROUND 14: (Starting in the first of the double V in any corner) begdc3tog in ch2sp, ch 1 (1 dc, ch 3, 1 dc) in next st, ch 1, dc3tog in next ch2sp, * (ch 1, 1 dc in next ch sp, ch 1, 1 dc3tog in next chsp) x 16, ch 1, 1 dc in next ch sp, ch 1, corner: (dc3tog in next ch2sp, ch 1, (1 dc, ch 3, 1 dc) in next st, ch 1, dc3tog in next ch2sp) *, repeat from * to * 3 more times omitting the last corner, ss in top of begdc3tog. (18 dc3tog + 19 dc along each side incl. corners). ROUND 15: standing sc in any ch3sp, (1 sc, ch 2, 2 sc) in same ch3sp, * 2 sc in next 36 chsp, (2 sc, ch 2, 2 sc) in ch3sp *, repeat from * to * 3 more times, omitting the last ch3sp, join with invisible join to standing sc. (76 sc along each side). ROUND 16: standing hdc in any ch2sp, (ch 2, 1 hdc) in same ch2sp, * 1 hdc in next 76 sts, (1 hdc, ch 2, 1 hdc) in next ch2sp *, repeat from * to * 3 more times omitting the last ch2sp, join with invisible join to standing hdc. (78 hdc along each side). ROUND 17: standing dc in ch2sp, (ch 2, 1 dc, ch 2, 1 dc) in same ch2sp, * (skip next 3 sts, ch 1, (1 dc, ch 1, 1 dc) in next st ), x 19, ch 1, skip next 2 sts, (1 dc, ch 2, 1 dc, ch 2, 1 dc) in ch2sp *, repeat from * to * 3 more times omitting last ch2sp the last time, ss in standing dc. (19 V-stitch along each side, + 4 double V in corners). ROUND 18: (Starting in the first of the double V in any corner) begdc3tog in ch2sp, ch 1 (1 dc, ch 3, 1 dc) in next st, ch 1, dc3tog in next ch2sp, * (ch 1, 1 dc in next ch sp, ch 1, 1 dc3tog in next chsp) x 19, ch 1, 1 dc in next ch sp, ch 1, corner: (dc3tog in next ch2sp, ch 1, (1 dc, ch 3, 1 dc) in next st, ch 1, dc3tog in next ch2sp)*, repeat from * to * 3 more times omitting the last corner, ss in top of begdc3tog. (21 dc3tog + 22 dc along each side incl. corners). ROUND 19: standing sc in any ch3sp, (1 sc, ch 2, 2 sc) in same ch3sp, * 2 sc in next 42 chsp, (2 sc, ch 2, 2 sc) in ch3sp *, repeat from * to * 3 more times, omitting the last ch3sp, join with invisible join to standing sc. (88 sc along each side). ROUND 20: standing hdc in any ch2sp, (ch 2, 1 hdc) in same ch2sp, * 1 hdc in next 88 sts, (1 hdc, ch 2, 1 hdc) in next ch2sp *, repeat from * to * 3 more times omitting the last ch2sp, join with invisible join to standing hdc. (90 hdc along each side). I hope you have fun making! 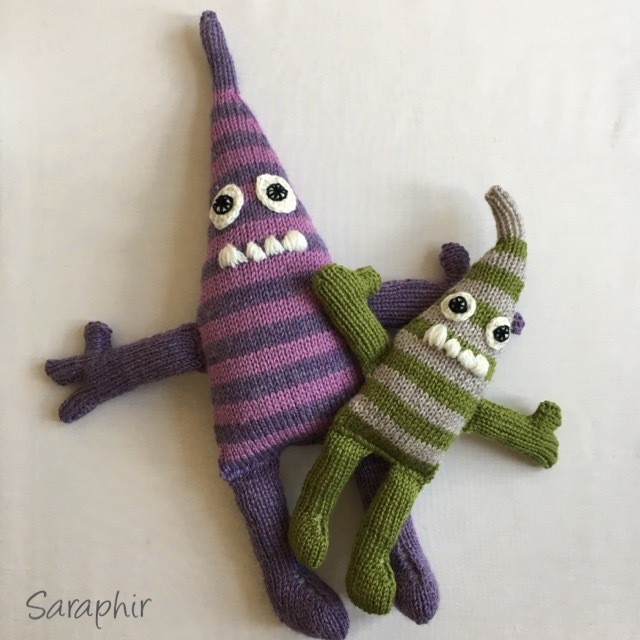 I always announce new patterns on my Instagram page, Facebook page and on Ravelry, so you can catch the next instalment as it comes out on any of those forums.